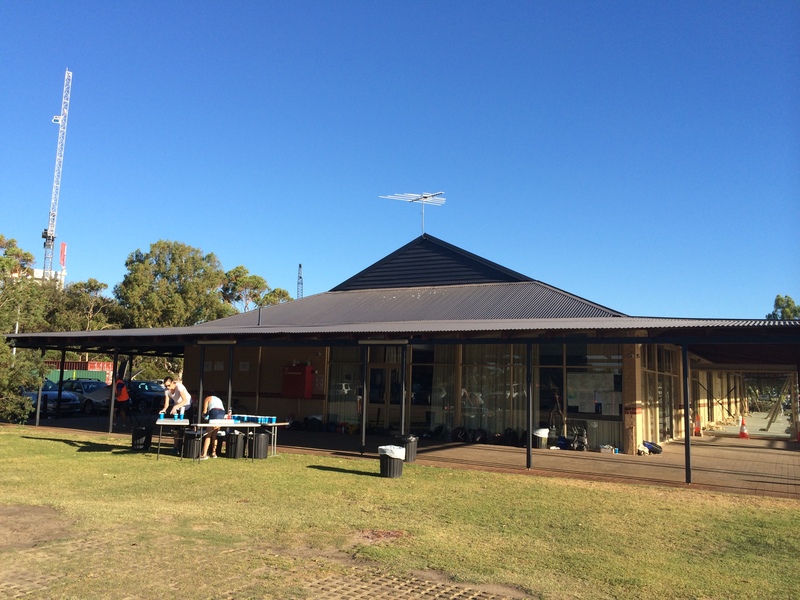 WAMC Club Rooms, Burswood, WA. Yesterday evening I went to my first race event of 2015, not as a runner, but as a volunteer. Taking out family membership of the West Australian Marathon Club (WAMC) in Spring 2014, several months before we left Kuala Lumpur, smacked of good intentions but in reality setting up a new life got in the way of actually participating in any (bar one, on my own) event. I rejoined without the family for 2015 and one of the conditions of membership was volunteering for at least two club race events this year. 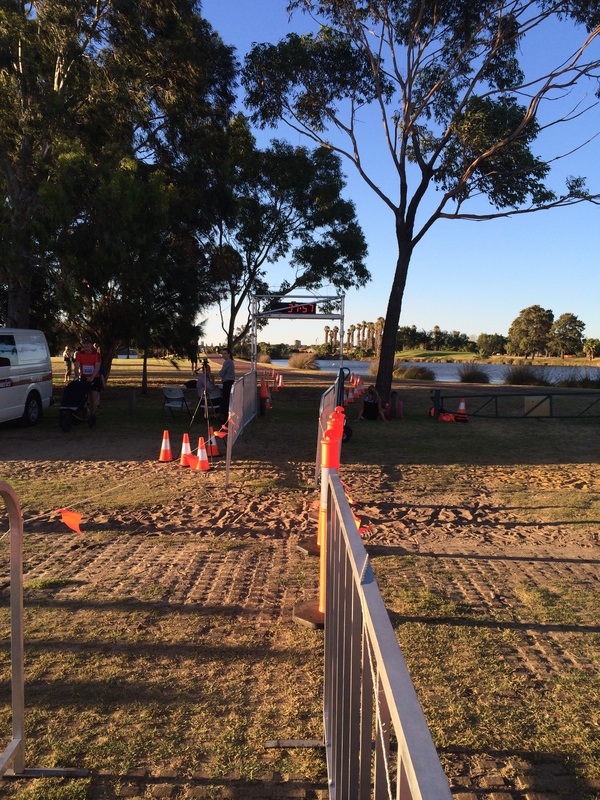 The Burswood 5km Twilight Run seemed like a good option as it was an evening race and only 25 minutes from home at the WAMC’s club rooms. It was nice to ‘rock up’ – that’s Australian for turn up by the way – without the usual pre-race nerves. Just the other kind of ‘I hope I don’t mess up’ nerves. Collecting money from non-registered non-member entrants was easy – there were only 16. My other job was to call out the number of each runner as they crossed the finish line and indicate if they were female. 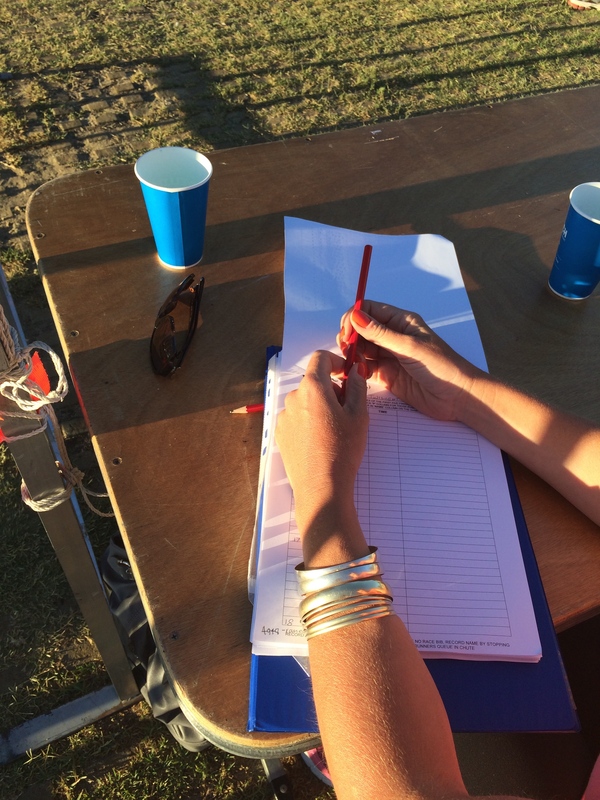 My fellow volunteer – now my Facebook friend who I plan to meet at a race next weekend – did a great job of noting down the numbers on the results list. And they’re off! 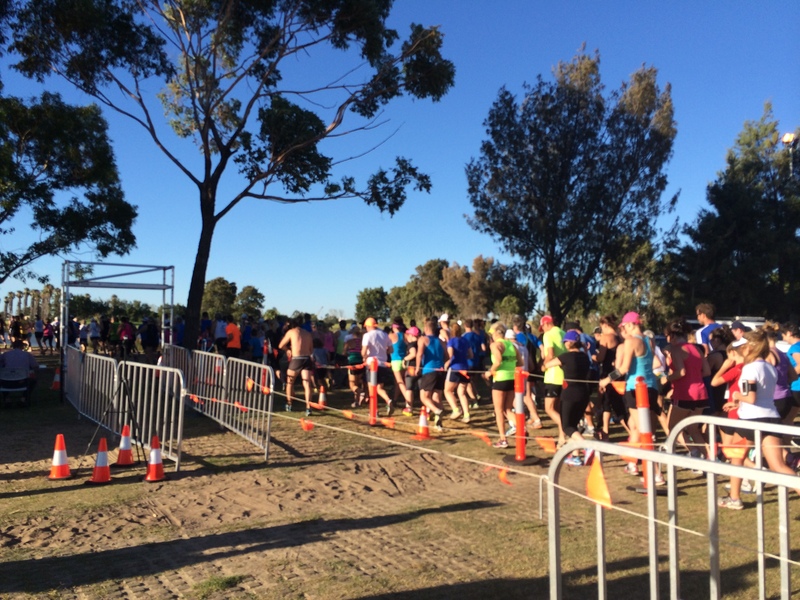 The start of the Burswood Twilight 5km Race. I think race finish lines must be some of the happiest places on earth, even if happiness comes in the form of tears of relief and vomiting. For the record there was no actual puking last night, but one lady was on the verge of retching. The majority of runners – there were 173 – wore WAMC club bibs which are made of fabric and pinned on the front of the torso. They are the kind of bibs that, if only pinned on with two pins, blow in the wind or fold over. I had to ask a few men to unfurl their low hanging bibs as I didn’t want to touch their bits. Thankfully I didn’t declare any men as females nor vica versa even though there were a couple of people, including kids, whose gender wasn’t clear until I got a close-up in the chute. It’s a short hair thing. Age-wise, runners ranged from around 6 or 7 to upper-80s. Most of the kids ran faster than I would have. Sigh. The finisher chute wasn’t empty for long. All in all it was a lot of fun to greet finishers, and congratulate them on a job well done. It was also a real eye-opener into how fast runners are here. Last night’s winner was Gerard Hill with a time of 16:21 in hot windy conditions. That’s 3:16 minutes per kilometre. The fastest lady, 22-year-old Hannah Castle, took a mere 18:41 minutes to complete the 5km (3:44 minute kilometres). I don’t think I could move that fast on a bike! Speaking of wheels, the fourth man across the line ran 17:06 – pushing a large toddler in a stroller. These elite runners made running look effortless. The winner popped over the line looking as if he’d been for an easy jog. Really, every person who ran last night was a winner, though only the top 3 finishers of each gender got medals. Even the lady who, on finishing, declared her run a personal worst was a winner in my eyes. At least she went out there and made an effort, which is more than most people (including me) did on a sunny Sunday evening. 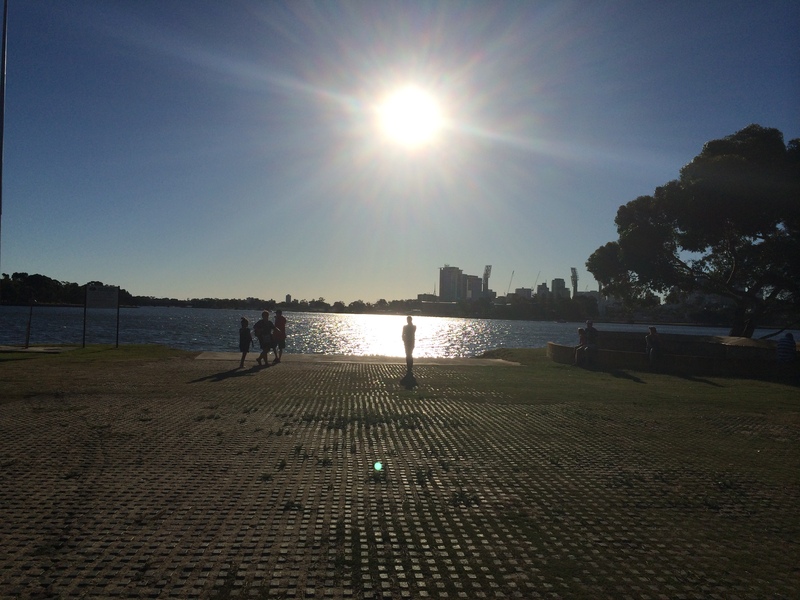 Sun going down over the Swan River at the WAMC rooms in Burswood.